For a while, I was very excited about QR codes (I jumped on the Fan bandwagon.) I still think that they are the best bridge between print and digital, but they never gained the popularity I expected. You see them here and there but nothing too significant and really, when was the last time you scanned one? The primary cause for this tepid popularity is the lack of support from mobile companies, not one of them support QR codes natively; you still need to download an app to scan them. To be fair you can’t blame Apple, Google and Microsoft for not supporting it, most QR codes you see have a bad execution to the point, that there are even a few websites dedicated to funny QR codes failures. Poor understanding of technology is the main culprit for these bad implementations. One would think since these codes are only for phones, internet connectivity would be of top priority when deciding where to use these QR codes, yet you still see them in tunnels and underground subway stations. Another overlooked factor is proximity, you need to be close to the QR code before you can scan it, so no QR codes on billboards, please. If a person does scan your QR code, make sure they go to relevant content that is mobile friendly. Remember; people are using their phones. If you are planning to use QR codes for your marketing strategy keep in mind that loading web pages are not the only thing you can do with the codes, there are many other uses, and some don’t even need an internet connection. 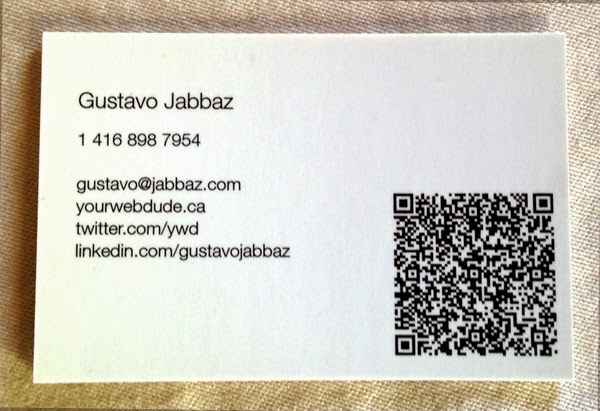 For example the picture in this post, my business card includes a QR code that loads my vCard right into your contact list. Take a look at all the thing you can do with QR codes beside loading a web page. Open IM clients such as Skype, AIM, MSN, GTalk and WhatsApp. If you want to integrate QR codes into your marketing campaign be careful how and where observe the tips above and don’t expect loads of people to use them. Finally, this point needs to be stressed: remember everyone scanning them will be using a phone. Do you have questions? Leave me a comment, or use the contact page, I’m happy to help to remove any concerns with QR codes. While you are at it, join my email list: get my new posts right in your inbox.